As the reality of the Guardian’s revelations about their party chairman Grant “Spiv” Shapps sink in, the Tory faithful have been circling the wagons and preparing to repel those inclined to that combination of cynicism and severely adverse comment which follows the discovery that yet another of their elected representatives has been caught with trousers well alight. The result has been revealing, if not helpful. 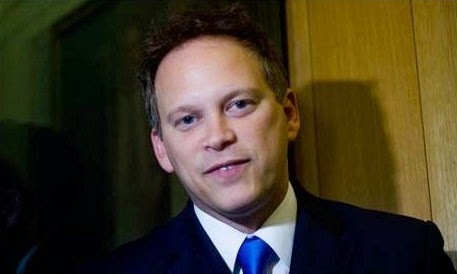 Just to recap: Shapps told that he no longer used his pseudonym “Michael Green” after he was first elected a MP in 2005. He also denied that he had another job after that time. Moreover, as Political Scrapbook has told, he “actually used his lawyers to bully one of his own constituents into issuing an apology after they called him a liar in relation to the ‘Michael Green’ pseudonym”. So what have his fans been saying? 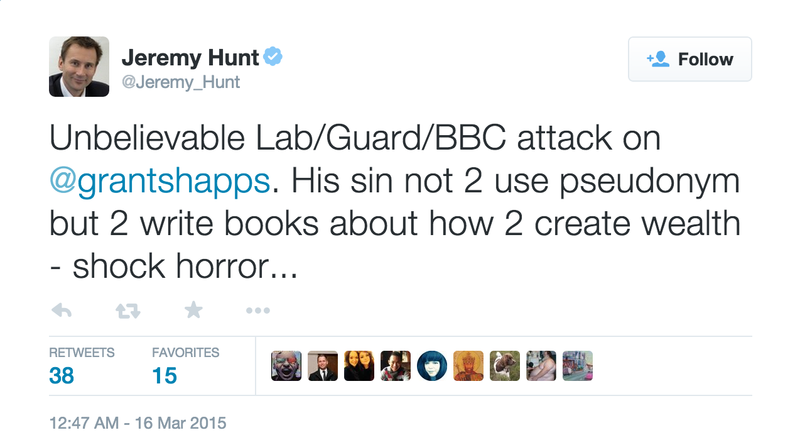 First off was a real cabinet minister, although it was only Jeremy Hunt, the former Culture Secretary: “Unbelievable Lab/Guard/BBC attack on @grantshapps. His sin not 2 use pseudonym but 2 write books about how 2 create wealth - shock horror”. 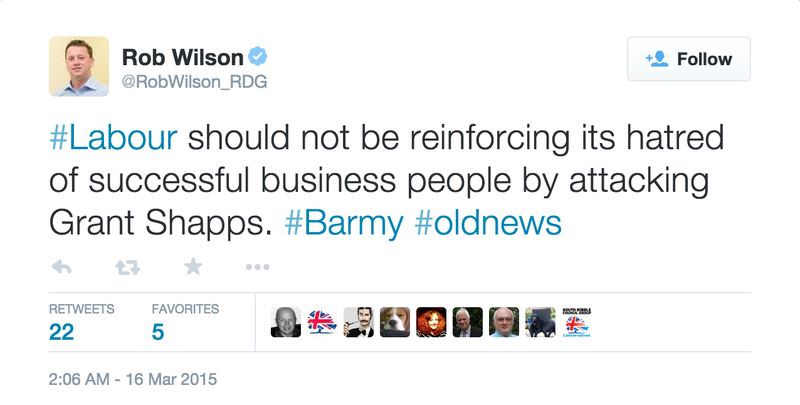 That “Labour - Guardian - BBC” shtick worked so well with phone hacking, did’t it? But Mark Clarke was not happy with LBC host James O’Brien. 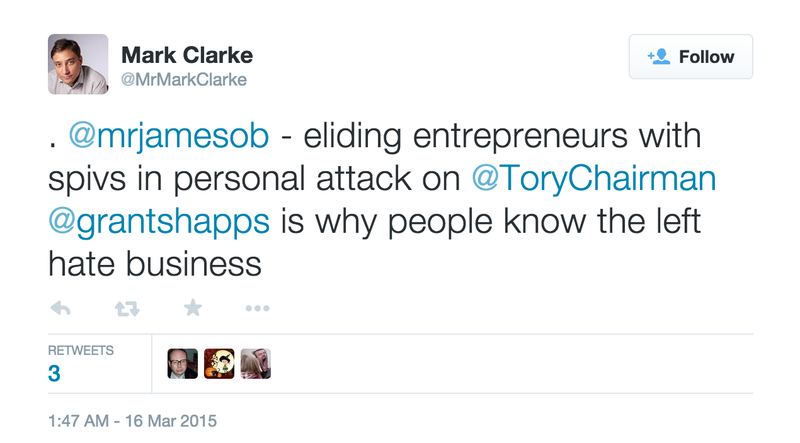 “Eliding entrepreneurs with spivs in personal attack on @ToryChairman @grantshapps is why people know the left hate business … Hypocrisy = @mrjamesob writing under pseudonym of ‘William Hickey’ but condemning @grantshapps for the same” he contended. Luke Springthorpe was there in support: “Spiv? Is that the word you use to describe people who start a business?” he demanded of O’Brien. 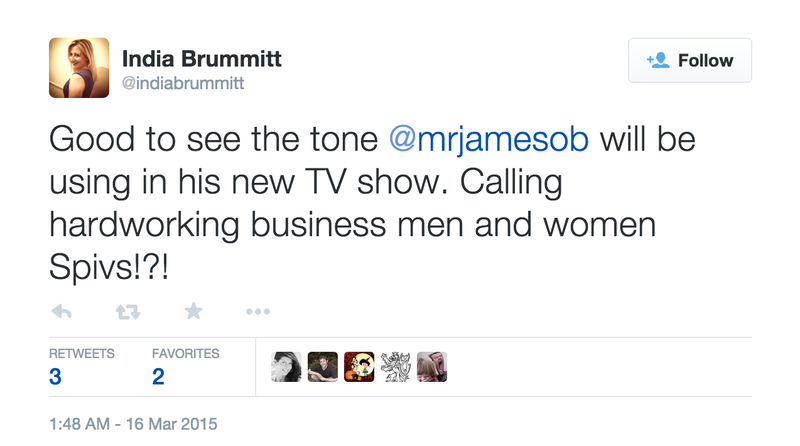 India Brummitt was there too: “Good to see the tone @mrjamesob will be using in his new TV show. Calling hardworking business men and women Spivs!? !” Rob Wilson, Reading’s answer to Fred Scuttle, was, in the meantime, kicking the Labour Party: “Labour should not be reinforcing its hatred of successful business people by attacking Grant Shapps”. More MPs? 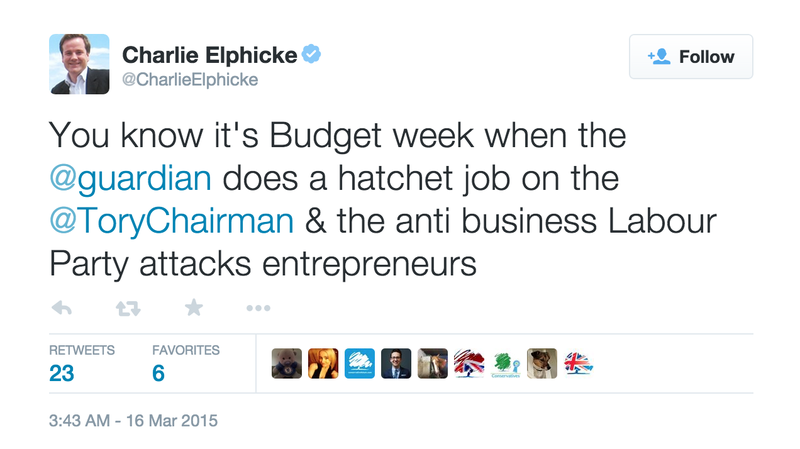 Here’s Charlie Elphicke: “You know it's Budget week when the @guardian does a hatchet job on the @ToryChairman & the anti business Labour Party attacks entrepreneurs”. 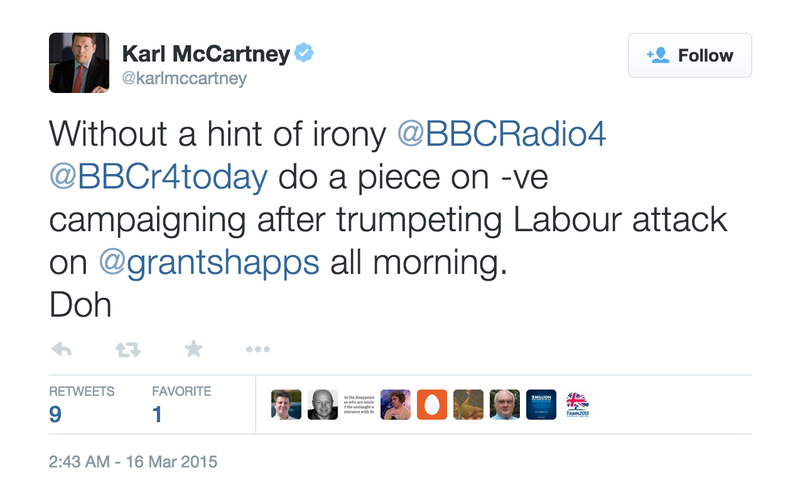 And Karl McCartney: “Without a hint of irony @BBCRadio4 @BBCr4today do a piece on -ve campaigning after trumpeting Labour attack on @grantshapps all morning. Doh”. No mention of the libel bullying? Doh indeed. How about an MEP? 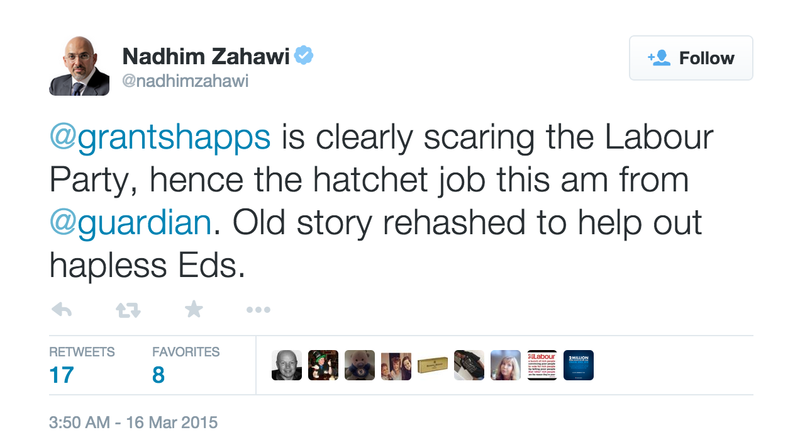 Nadhim Zahawi’s your man: “@grantshapps is clearly scaring the Labour Party, hence the hatchet job this am from @guardian. Old story rehashed to help out hapless Eds”. Good, reliable rebuttal. 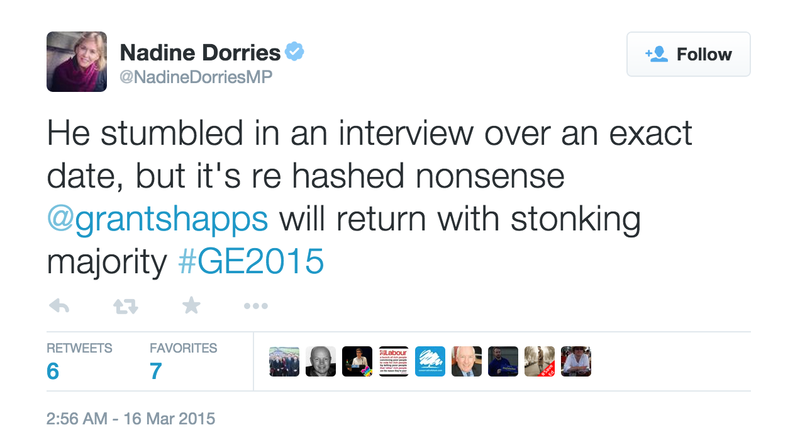 And here’s (yes, it’s her again) Nadine Dorries: “He stumbled in an interview over an exact date, but it's re hashed nonsense @grantshapps will return with stonking majority #GE2015”. All well and good, BUT. I don’t want to look over there, thanks. Shapps has lied time and again. He’s bullied a constituent on a false premise. HowTo Corp, which has only just been wound up, was selling software that was in flagrant breach of Google’s rules. He is indeed a spiv. He should resign or be kicked out. He won’t. So that’s Tories Own Goal 1. Again. spiv. A flashy, slick operator who makes a living more from speculation or profiteering than from actual work. Seems to fit the bill. If his schemes are so successful why share the secrets? Its like the woman who sells lucky heather, it has been so lucky to her she has had to sell it for 25 years on the streets of Leeds! The Grant Shapps guide to making money.